Shot with a Canon 7D and a Canon 70-200 MM F4 lens, 1/500th of a sec at F/10. While on a family trip to Japan we came up out to the Tokyo subway and were surprised to find ourselves surrounded by thousands of festival goers watching a parade. My son Cody and I both started shooting away at all the color and pageantry that was surrounding us. I spotted what appeared to be three Geisha girls who were just about to enter the parade. I tapped one of them on the shoulder and motioned that I would like to take there photograph. She agreed and I quickly fired off 12 frames before they walked off and joined in the parade. 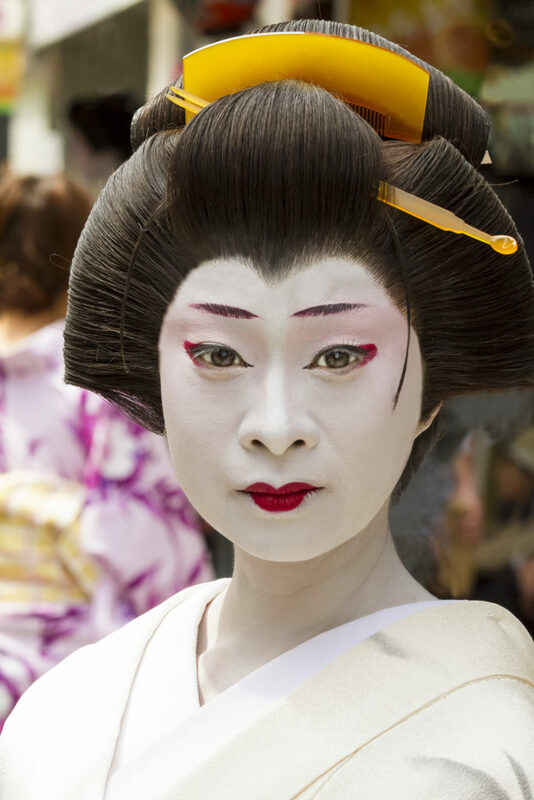 One of the three seemed rather large and manly with a deep voice and I suspected that they were not really Geisha Girls!